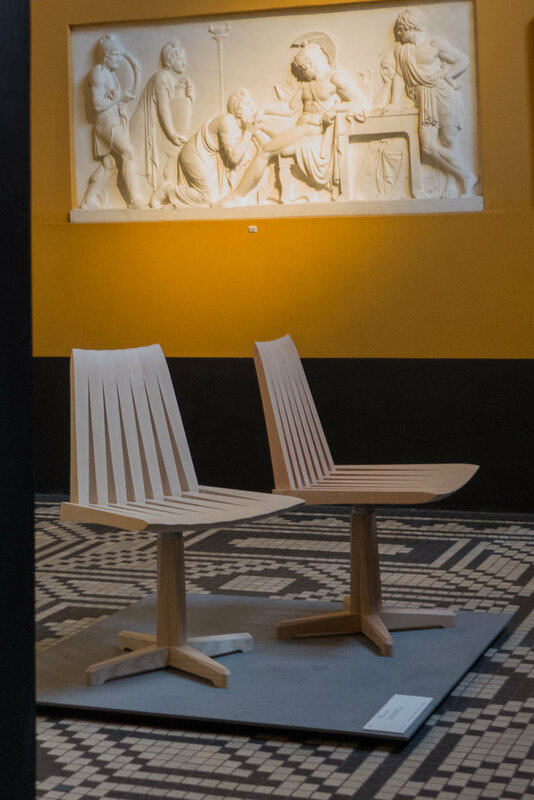 Through November and into early December this year, 2018, MONO - a major exhibition of furniture by cabinetmakers - was shown in the rooms of Thorvaldsens Museum in Copenhagen. This was the annual exhibition - Snedkernes Efterårsudstilling or Cabinetmakers’ Autumn Exhibition. Generally, furniture shown here is not in production and many of the pieces were designed specifically for the exhibition as it is an opportunity to try out ideas or try new forms or to use materials in unconventional ways that might not be obvious for a commercial manufacturer and, above all, designers find ways to highlight the skills of the cabinetmakers. The Cabinetmakers Autumn Exhibition for 2018 has just opened at Thorvaldsens Museum in Copenhagen. SE - Snedkernes Efterårsudstilling - The Cabinetmakers’ Autumn Exhibition - is an association of 81 designers and manufacturers. Each year their board select a venue for their exhibition and set a theme along with any specific rules for a particular year - often to do with dimensions but this year also stipulating colour - so each work will be restricted to just one colour with the choice limited to either the natural colour of the material itself or to one of the strong and distinctive colours used in the original decorative schemes of rooms in Thorvaldsens Museum. Each year, guest designers and guest manufacturers can apply to show their work. When setting the theme for this year, MONO was suggested to imply a range of associated ideas through monochrome, monolith, monopoly and monologue. 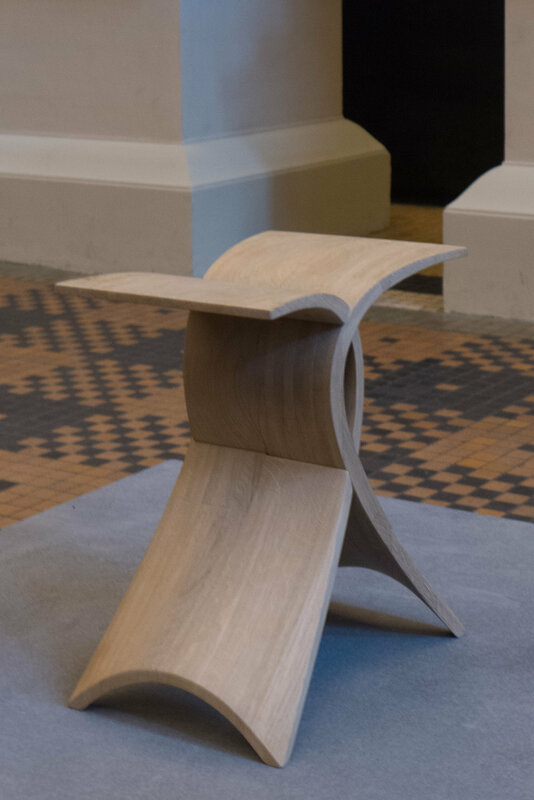 A subheading for the exhibition - furniture shaped by craftsmanship and insight - is important and significant: these pieces highlight the skills and the experience of the cabinetmakers who, in some pieces, take their chosen materials to new extremes and, in all the works, push their workshop techniques to the highest level of quality. So the exhibition is in part about the style and the form of each work but because, the cabinetmakers also represent a long and well-established craft tradition in Denmark, these pieces are about understanding the materials, to know what can be done and how, and to use incredible skills to shape, finish, join, refine or reduce the parts that make each work. There are forty one works in the exhibition. 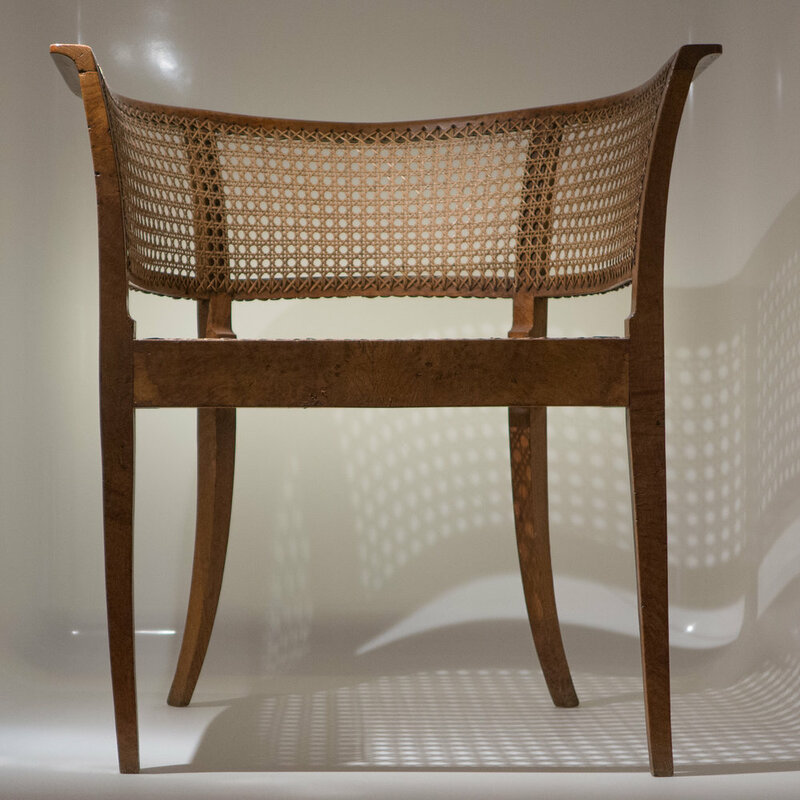 Most were produced in a partnership between a designer and a cabinetmaker or furniture manufacturer - in many cases a partnership that is now well-established over many years and over several projects shown at the Autumn Exhibition although several pieces were both designed and made by the same person. The exhibition is also an opportunity to experiment or to produce designs that might otherwise not be commissioned … the aim is not only to challenge the skill of the maker but also to challenge the preconceptions of the visitor. 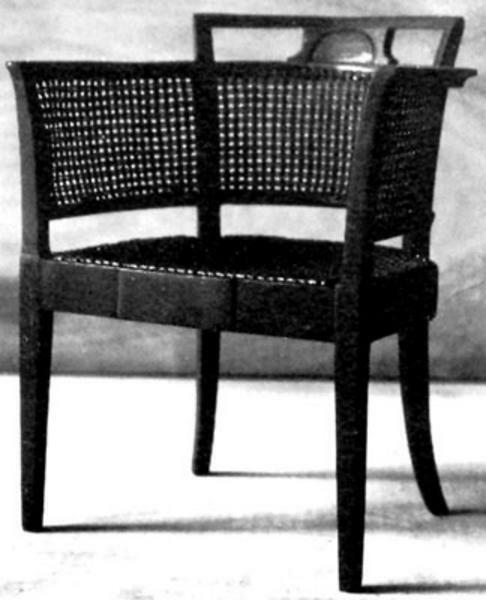 Klint himself acknowledged that Petersen had suggested changes to the design of the chair and implied that the most serious discussions were about the way that the top of the back rest should or should not curve outwards. why does Denmark produce so many 'good' chairs? 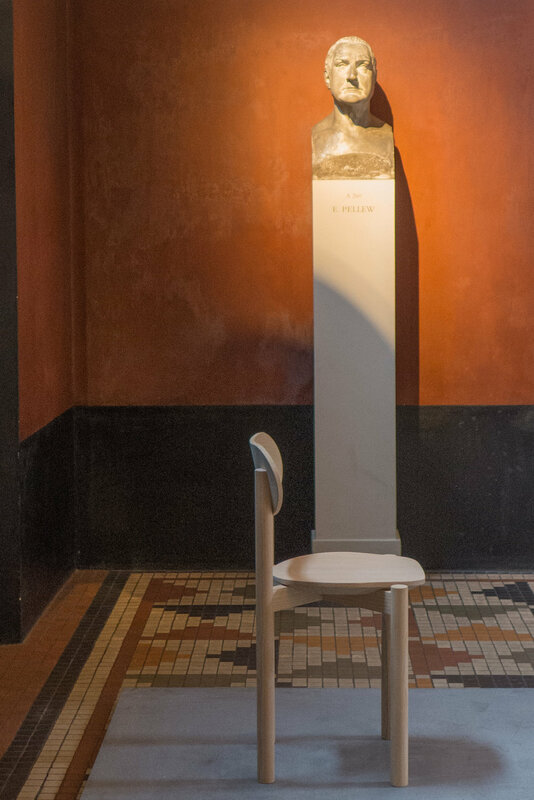 Chairs are a common pieces of furniture in most modern homes around the world but the chair has a special - almost an iconic place - in the history of modern design in Denmark. At the design museum in Copenhagen, in a relatively new gallery, chairs from their collection are each given their own space, each elevated and each given spotlights that are set to come on as you approach. Don't get me wrong … this is not a criticism … actually far far from a criticism because by lifting the chairs up from their normal place - on the floor with and amongst other furniture - you can appreciate the different designs; you can look at the details and see how the chairs are put together; and with the chairs arranged in groups you begin to see how they fit into a context or a sequence of similar or of very different chairs and, above all, you can see how well made most of them are … so they certainly deserve our attention. 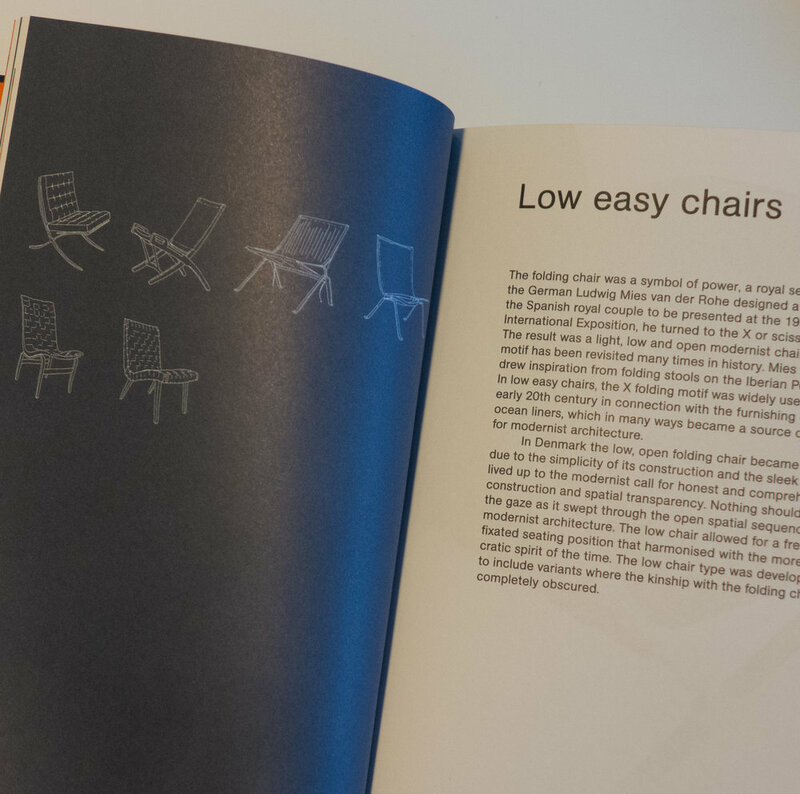 But then take a step back … so why so many different beautiful chairs and from a relatively short period of time? 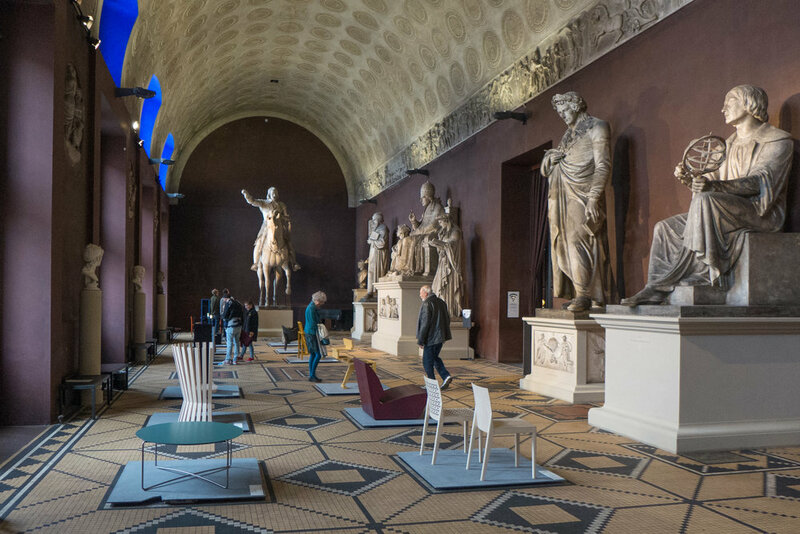 - most in the gallery date from the period from 1930 to the last decade of the last century - and why so many chairs from a relatively small country? 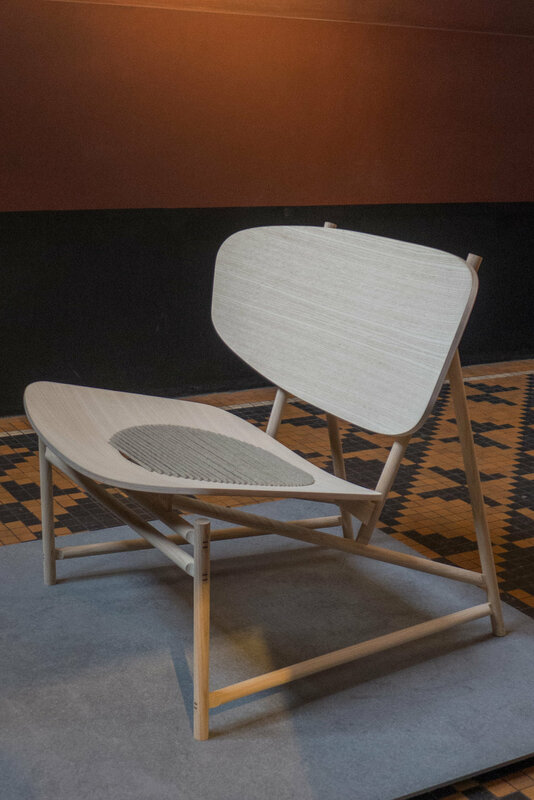 They receive well-deserved acclaim and not just in Denmark but internationally - so much so that these chairs are widely imitated and, in some cases, they are copied so carefully that some are passed off as originals. 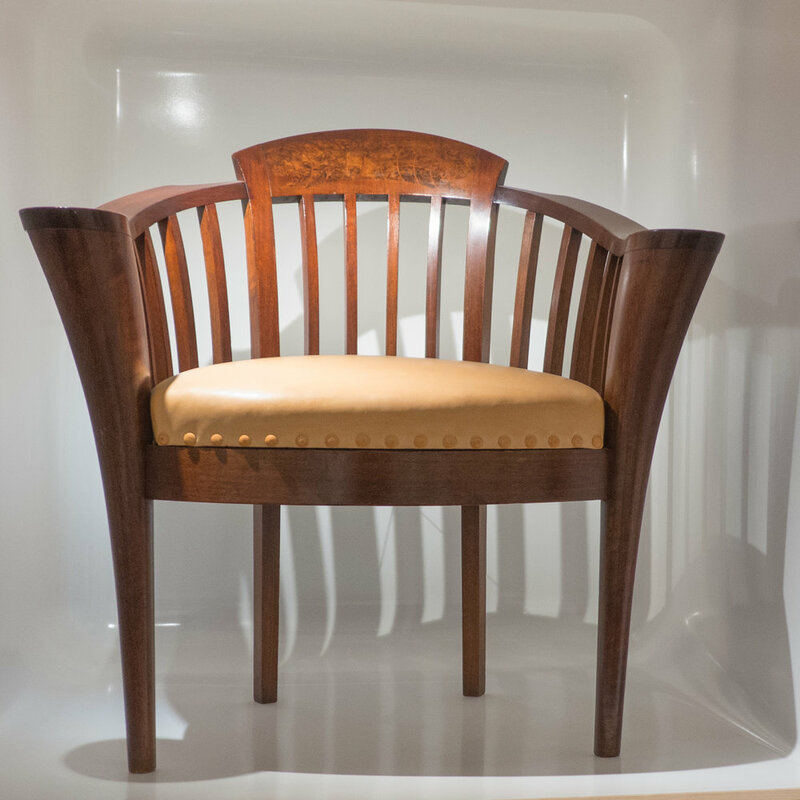 Some chairs from the 1950s and 1960s, by certain designers, now achieve almost eye-watering amounts of money in auctions. And yet they were all made simply so that we can sit down. 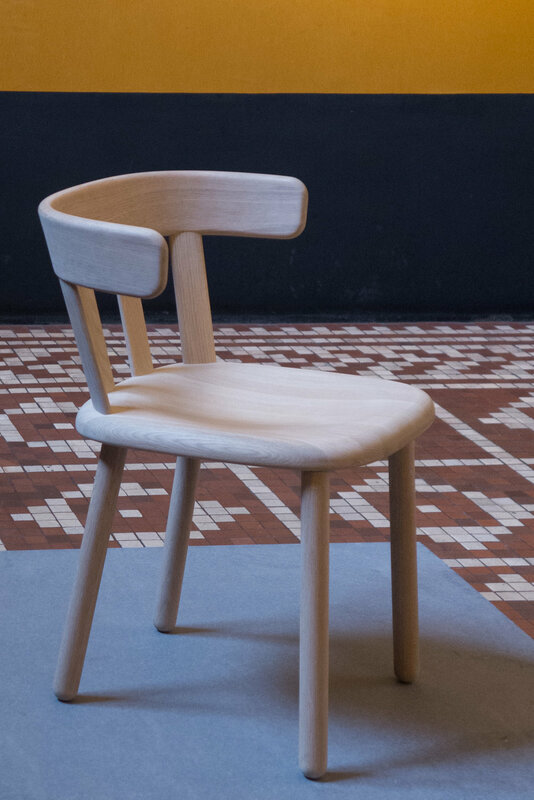 Hans Wegner is said to have designed 1,000 chairs and of those 500 went into production. 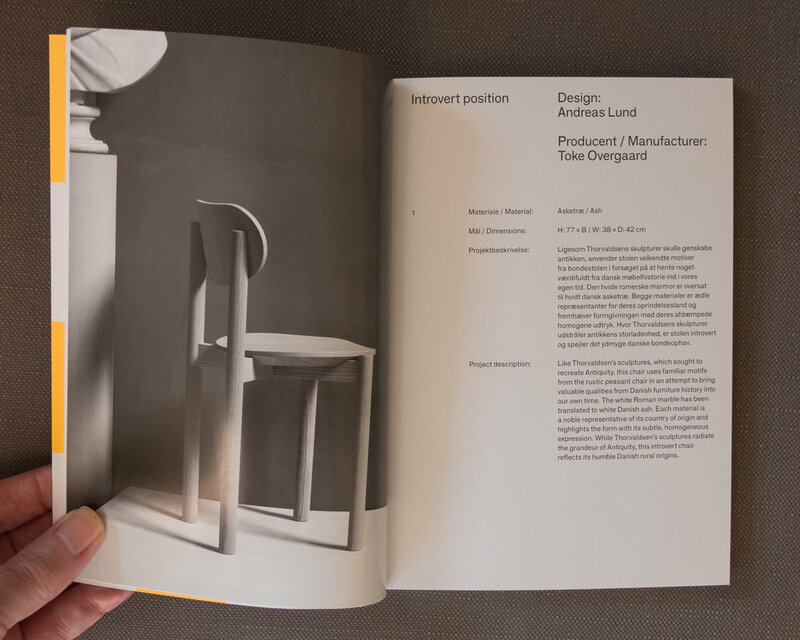 An exhibition in 2014 at Designmuseum Denmark was a thorough assessment of his remarkable work and took its title - just one good chair - from a comment by Wegner himself. At Designmuseum Danmark there is a relatively new display of their collection of modern chairs where the chairs are arranged by type rather than by designer or by displaying the chairs in chronological order. 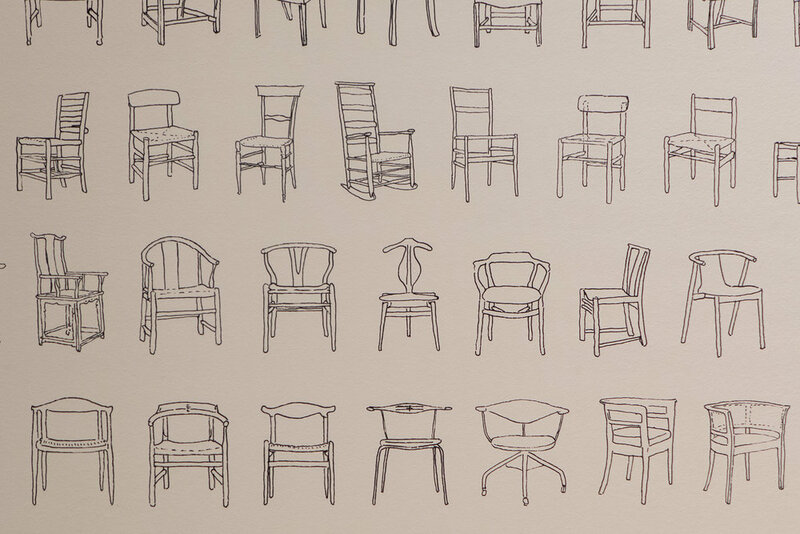 The museum typography for their chairs is one good and clear way of putting the chairs into fairly distinct groups where each group is defined by a form or shape and by the style of a chair … the form of the chair, techniques of working with a material and details of construction and style, being closely interrelated. 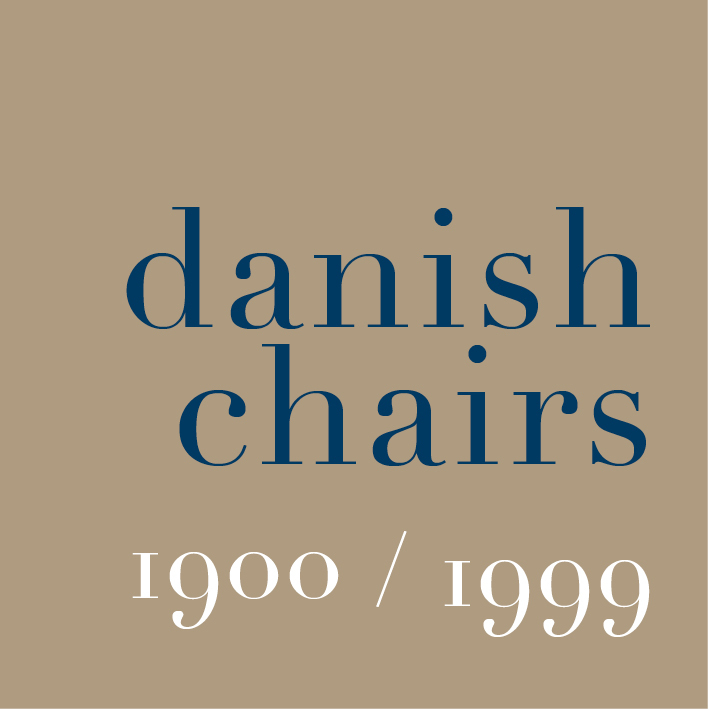 Most of the chairs date from the 20th century and were made by Danish cabinetmakers or Danish manufacturers although several older chairs and some chairs from outside Denmark are included where they provide evidence for how or why or when a specific Danish design evolved or if they are relevant evidence from a specific or wider social or historic context. Most of the chairs are made in wood but there are chairs in metal tube, metal wire and even plastic so there are interesting examples where closely-related designs - in terms of style and shape - can be seen in tube-metal alongside a version in bent-wood although obviously the techniques and the details of construction are very different. 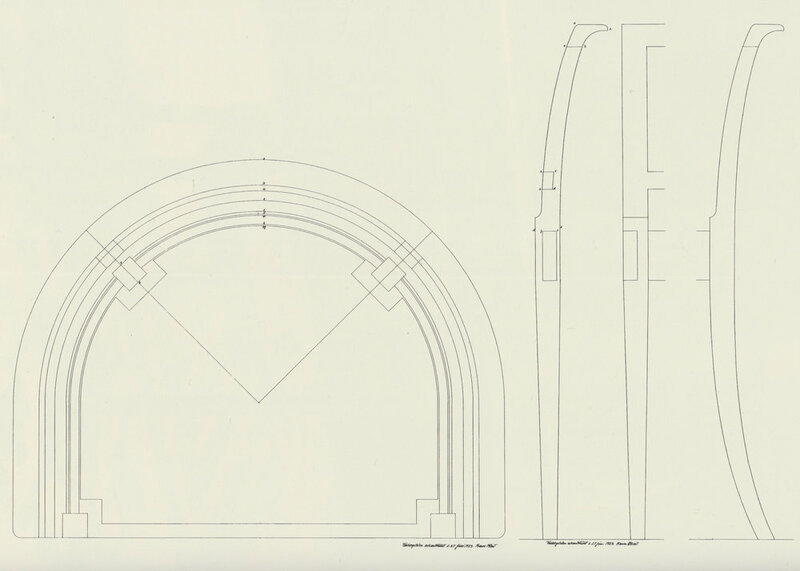 The main groups, defined by the museum, are Folding chairs and stools; Easy chairs - so generally lower and wider chairs - and Windsor chairs - with vertical spindles across the back to support the top rail or, in taller chairs, a head rest. Chippendale chairs have a sturdy frame of square-set legs, usually with stretchers between the legs, and a relatively low back and when they have arms these are housed into the uprights of the back. 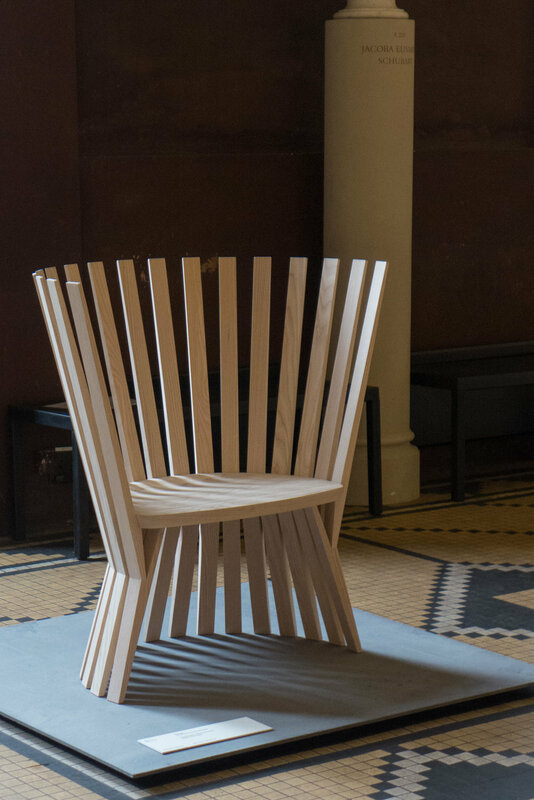 There is a group derived from Shaker chairs, from America - often with horizontal slats across the back. Chinese chairs and steambent chairs, are similar to the Chippendale Chairs but are distinct in terms of the sitting position which is more upright and more formal and generally the top of the back rail sweeps round into arm rests as a single rather than separate pieces. Round arm chairs and Klismos chairs also have curved and relatively low back rests that continue round into arm rests - with The Chair by Hans Wegner perhaps the most famous Danish example. 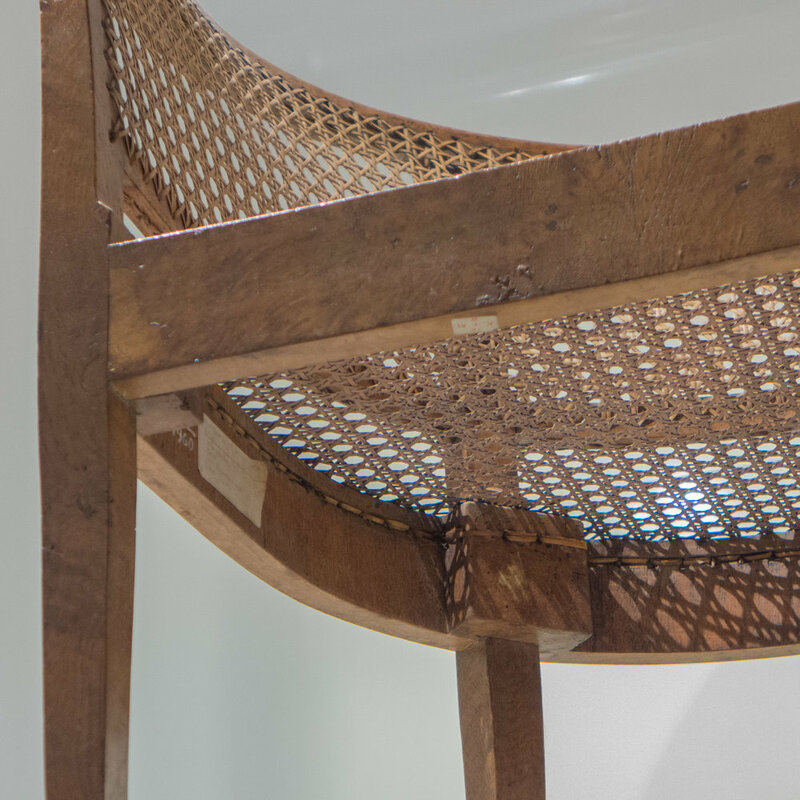 A Klismos or Klismos Chair is a distinct classical or Greek type with short curved back rest across the top of the back uprights that are usually tapered and splay out down to the floor in a curve. Shell chairs include chairs in moulded or shaped plywood, moulded plastic or metal with shapes that provide, usually in one piece, the support for the seat and back without a framework, and are usually on a separate frame of legs or on a pedestal, that can be made from a different material to the shell, although there are shell chairs where seat, back and support are all moulded. The final group are Cantilever chairs where normally there is a strong base on the floor and some form of support for the front of the seat but no legs or support under the back of the seat - an interesting but not a common type in Denmark. 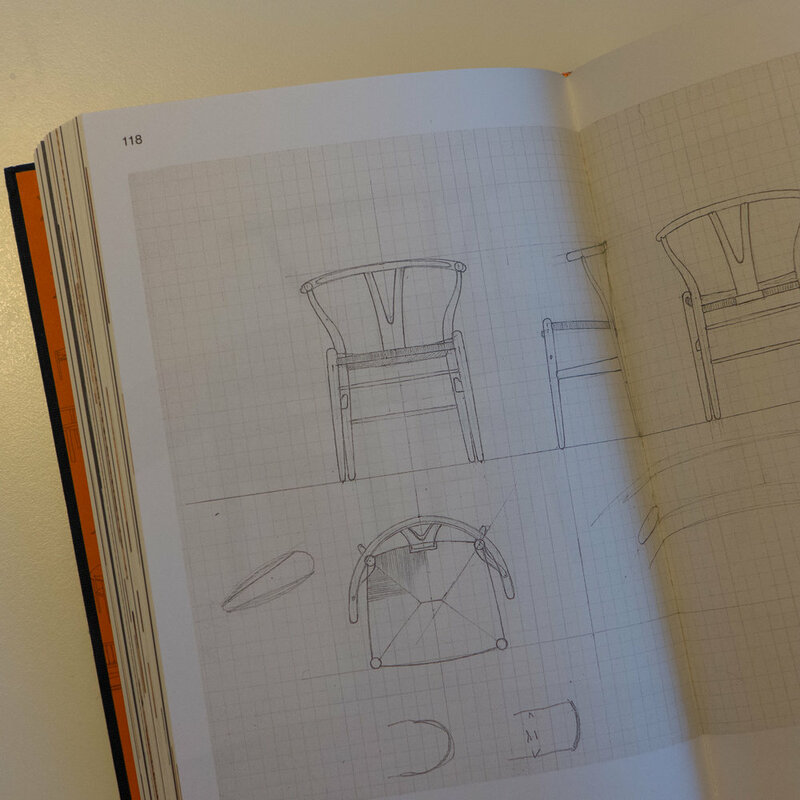 The study and analysis of chair designs from different periods has been an important part of the training for designers in Danish schools of architecture and schools of design for a century. 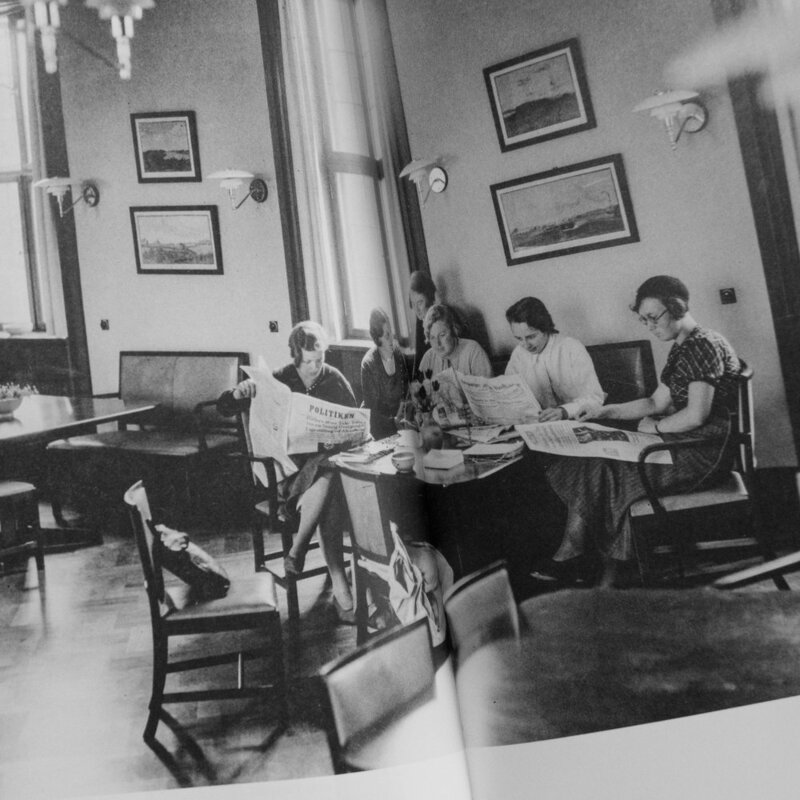 In the 1920s, the architect Kaare Klint was responsible for the conversion and the fittings of the buildings of an 18th-century hospital to form an appropriate exhibition space for the museum of Danish design - then called the Kunstindustrimuseet Danmark which emphasised the close relationship between design and production. Klint taught design in the museum where he encouraged architects and furniture designers to study and draw historic pieces and to study and appreciate cabinet making techniques even if most were not craftsmen themselves. This division of chair types in the design museum is different from the groups set out by Nicolai de Gier and Stine Liv Buur in their important book Chairs' Tectonics where primary divisions are by material and then by the form and structure … so they look specifically at how the seat, back rest and support or legs are joined or fixed together and take that as the starting point for their classification of chair types. Graphic design: Rasmus Koch Studio. Light design: Jørgen Kjær/Cowi Light Design and Adalsteinn Stefansson. this was posted initially on the 2 October but has been moved up to make a more-sensible introduction to the series of posts about chairs that were posted through October. 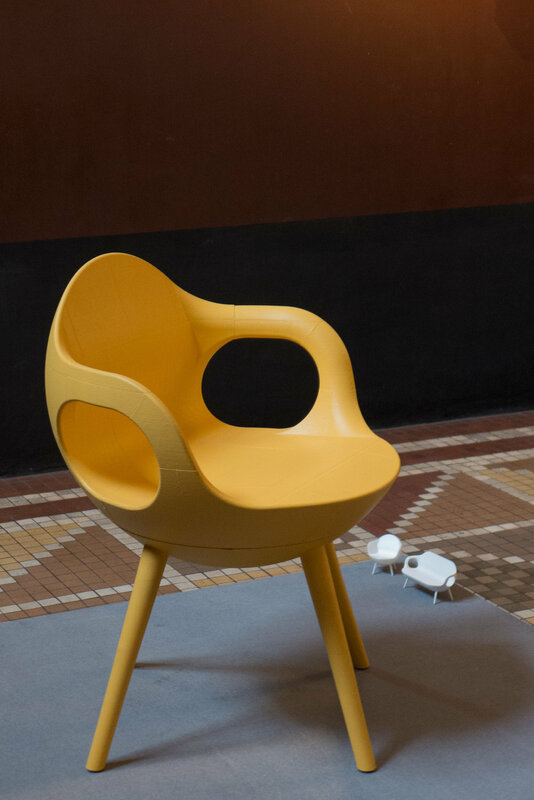 The chairs were selected because they are important examples from major Danish designers but they also cover all the types of chair in the design museum typology. These posts on chairs are also an experiment for this site in trying to present more photographs and slightly more information than is normal in a blog to highlight and analyse key features of each design. Designmuseum Danmark can only display a proportion of their collection and, even when an object is shown in a gallery or exhibition, there is usually a limit to how much information can be included on a label or in a leaflet or guide so the on-line catalogue of the museum is an amazing desk-top resource for finding out more about an object or more about a designer or a manufacturer. 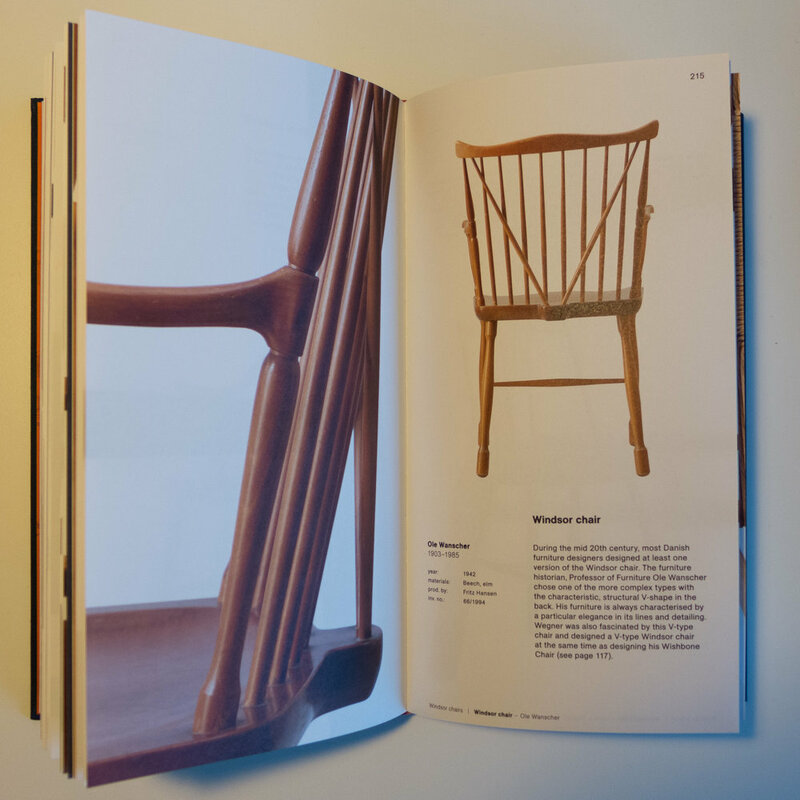 There is a separate index for the museum's collection of furniture and this can be searched by category; by a specific year or a decade; by the name of the designer or the cabinetmaker / manufacturer or with key words and the search can be narrowed down by selecting, for instance, a type of wood from a drop-down list. Inevitably, the amount of information revealed through the search varies slightly from object to object - the museum points out that the catalogue is being updated as new information becomes available - but there is usually a photograph and often several view points, and there are dimensions; materials; usually a date of acquisition and, if the piece was purchased by the museum rather than given as a gift, there is often the name of the auction house and a date because sale catalogues can be an important source for more information. 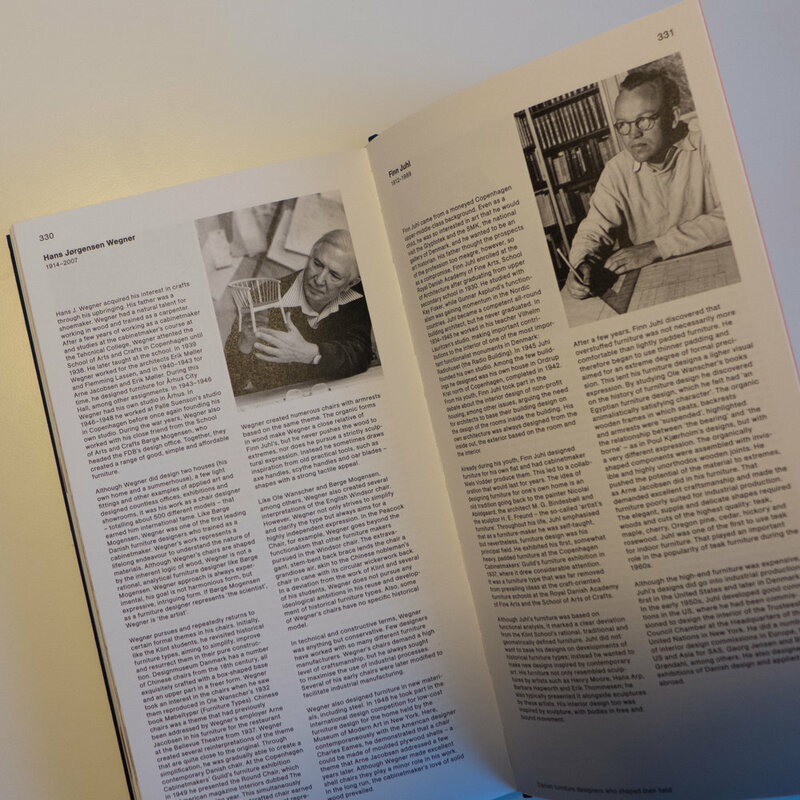 And for major objects there can be a specific bibliography if it has been included in a publication or an exhibition catalogue. Ultimate Impact - an exhibition curated by Tina Midtgaard of the design studio Superobjekt - explores the culture of Scandinavian design through the works of 33 artists … photographers, ceramicists, glassmakers, cabinetmakers and textile designers. Strong visually and important as an intellectual exercise about the imagination - the artists’ and our own - the works are arranged by five ‘phenomena’ - Fantasy, Exoticism, Silence, Ragnorak and Baroque. It is the juxtapositions of pieces and the reverberation or resonance or contrasts of colour or texture or material across the space that is important. Two works use sound and all the pieces experiment in very different ways with form and light and shadow. This exhibition deliberately questions any lingering preconceptions about Scandinavian design and style. As a venue, the gallery itself is dramatic, approached by a long spiral brick ramp to climb the round tower, and with the beams and posts and braces of the 17th-century space high above the church itself and, with the massive timbers painted grey and with plain white walls, the architecture provides a strong but open framework for such a complex exhibition but without competing and, with natural light from both sides, there is also the space that is essential for moving around and between the works. This, together with the high quality of the works, makes the exhibition an appropriately challenging but very rich and rewarding experience. 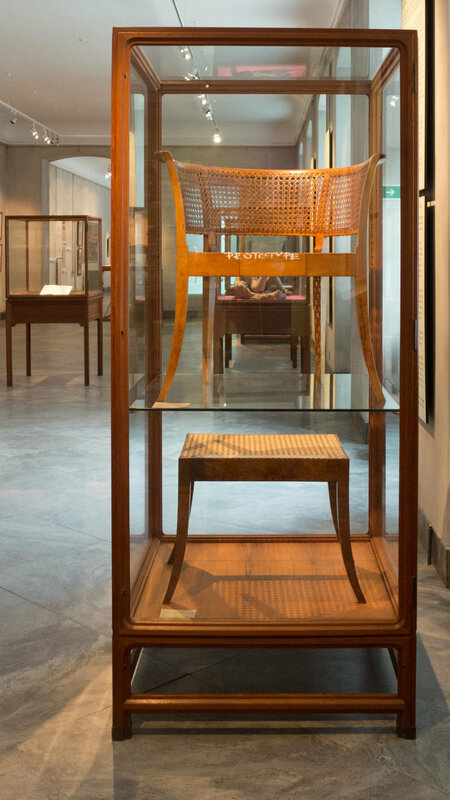 Part of the collection of modern chairs at Designmuseum Danmark, has been moved into a newly refurbished space in one of the long narrow galleries in the south wing to the right of the entrance. The new display is stunning and with each chair shown in a self-contained box and with good lighting and clear succinct labels it is possible to really appreciate each piece of furniture. The chairs are arranged on three levels … the middle row at about eye level, the lower chairs angled up and the upper tier angled down slightly so the gallery has something of the feel of a barrel shape or barrel vault and each chair is angled to optimise the view point for the visitor. Of course, there are some down sides in that it is not as easy to get a sense of the chair as a three-dimensional work but this new arrangement does let you get very close to look at details and for the middle and upper rows it is possible for the first time here to see the underside of the chairs if you are interested to see how they are constructed. In the Spring and through into the early summer, there was an important exhibition of the works of the Danish artist Vilhelm Hammershøi at the museum and gallery at Ordrupgaard which is just to the north of Copenhagen. With the title At Home with Hammershøi, the exhibition focused on an amazing series of paintings of interiors that he produced when he and his wife were living in an apartment that they rented in Strandgade in Christianshavn from 1898 through to 1910. The rooms have plain walls that were painted in soft greys or creams with all the woodwork simple colours - rather than picked out with any gilding - and furniture is relatively simple, set back against the walls, although they had a piano, at least one bookcase and with a few small paintings and simple pottery. This is in marked contrast to photographs and paintings that survive of what must have been more typical middle-class homes in the city with carpets, heavy curtains, upholstered furniture and banks of paintings on the walls. Was Hammershøi reacting to the clutter of rooms in middle-class homes of the late-19th century? Was it simply that furniture was carefully rearranged for the painting? Was it a consequence of poverty or, at least, the relative poverty of an artist although he came from a middle-class family and while they lived in Strandgade, Hammershøi spent time in London and in Rome. These paintings are certainly not about ostentatious affluence. Whatever the reasons for their restrained good taste, they do seem to reflect a clear and recognisable Danish design aesthetic and these are interiors that we can appreciate as distinctly modern. The reason for a trip out to Ishøj was to take photographs of the work in progress on the landscape around ARKEN … the gallery of modern art on the foreshore. Really, it was a matter of just watching the weather to try and time a visit to a day when the skies were relatively clear of clouds so, oddly, no thought was given to the current exhibitions … not even as far as checking on the web site before the trip as it would be a matter of spending time around the outside of the building where there is open access. At most the plan was maybe to go in for a coffee - particularly as the day chosen turned out to be bright and clear but also very very cold. So the exhibitions were a surprise and curiously felt like a bonus. Generally, although I go to a fair number of art exhibitions, they are not reviewed here … it needs a bit of effort just to keep up with the exhibitions around architecture and design … but the works by Gerda Wegener and the very very different show of sculptures by Niki Saint Phalle are certainly worth both time and effort. They certainly justify a trip out to Ishøj. In very different ways the exhibitions are about women on the edge of society whose art shows a element of escapism … a realisation that their lives are clearly not everyday ... so about how they embraced, celebrated and expressed that realisation of difference. Gerda Wegener was born in 1885 and died in 1940. She was a prolific illustrator as well as a painter and worked for a number of fashion magazines … then as now essentially about escape and unreality. Motifs and colours and subjects like the paintings of fast cars and travel link the style definitely to the contemporary Art Deco movement but it was also fascinating to see how closely Wegener, painting actresses and scenes like the card player in Queen of Hearts, actually had much in common with the tradition of Flemish and Dutch conversation pieces … intimate scenes far removed from formally posed portraits. Gerda Wegener spent much of her time in France with her husband Einar Wegener and their life is very much in the spotlight now as the subject of the recent film The Danish Girl. Niki de Saint Phalle (1930-2002) was a French-American artist whose work is about as far from a Vogue photo spread as it is possible to get although, in fact, when young, de Saint Phalle did work as a fashion model for Vogue. Her sculptures are vibrant with loud strong colours and the shapes of her figures are, to put it mildly, larger than life - overblown. What comes across well in this exhibition is the huge amount of energy she had, producing works that were used for dance productions or works that filled an extensive garden landscape - The Tarot Garden in Tuscany. On any trip out to ARKEN there’s also the chance to look again at the gold heads of the animals of the signs of Zodiac by Ai Weiwei … magical and part of the display of the permanent collection. The trip out to Bronsby Strand to take photographs of the housing scheme was also the opportunity to revisit the art gallery at Arken to look at how new work on its landscape has progressed over the winter. Back in 1988 a competition was held to select an architect to design a new art gallery in Ishøj to the west of Copenhagen. A design by the young architect Søren Robert Lund won and the new buildings opened in 1996. Initially, the hope had been to construct the gallery on the beach to look out over the bay but for conservation reasons it was set back behind low sand dunes between a lagoon and the Strand. The setting was stark, little more than a rather exposed and uneven area of car park. That has all changed and in the most dramatic way with the excavation of extensive areas around the gallery which has allowed water to flow around the building and link through to an extensive area of lagoon to the west to create a new island for the gallery that can now only be reached by three new bridges or causeways. Car parking has been spread out with some along the public road to the north, where public buses also stop, some to the east and, more between the gallery and the sea and reached by a new causeway but with the cars hidden by low dunes. Only just completed, there has been no time for sedges, grasses and trees to become established but already the transformation is little less than miraculous. Where the building looked rather stark and rather temporary, more like a boat yard than an international exhibition space, light off the water now creates shaper shadows and throws texture into relief and the structure of the restaurant across the south side, with its ribs reminiscent of the hull of a raised and stranded boat, now seems to make sense. Inside the gallery, the entrance area to the west is flooded with reflected light from the large area of water on that side and light is reflected up into the restaurant. Now all that might be left to do, apart from allowing the natural vegetation to grow, would be to consider breaking through just a few more window openings to bring more light into the gallery spaces. The partnership of Møller & Grønborg are the landscape architects for the new work.